Mr. Sloto is all about celebrations - and this March he'd like to celebrate St. Patrick Day's all throughout the month (and also celebrate you're here!) when you deposit as little as $25 to play with up to a 217% Match plus 50 Free Spins! Lucky 6 will be your good luck charm this month with symbols like rainbows, green hills, pots of gold, four-leaf clovers and leprechauns will have you picking more than clovers! Land 4 or more of the Lucky 6 scatter symbols and win up to 25 Free Spins! 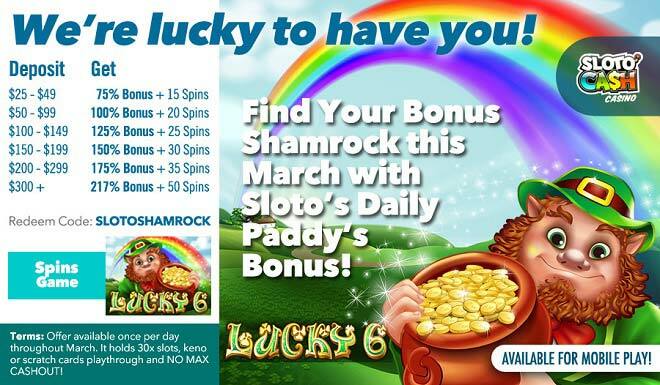 Treasure hunters often track down a leprechaun by the sound of his shoemaker's hammer - and you can track wins when you deposit as like as $25 to play with Mr. Sloto's Daily Bonus Shamrock! Offer available once per day throughout March. It holds 30x slots, keno or scratch cards playthrough and NO MAX CASHOUT!